The topside of Elia’s Offshore SwitchYard (OSY) platform has left Heerema Fabrication Group’s construction site in Zwijndrecht, the Netherlands, and was loaded onto a barge. 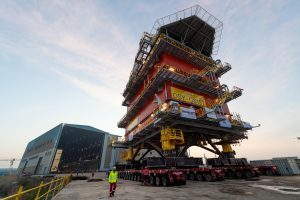 According to Elia, the topside left the construction site this morning, which represents the first step in the journey towards its final destination in the Belgian North Sea. The topside will be fitted onto its jacket foundation later this month, the Belgian transmission system operator said. The OSY platform is part of Elia’s Modular Offshore Grid (MOG) project which will connect the Rentel, Northwester 2 and Seamade offshore wind farms to the Belgian grid. MOG is slated for commissioning in the third quarter of the year, while full capacity is expected to be available in 2020.